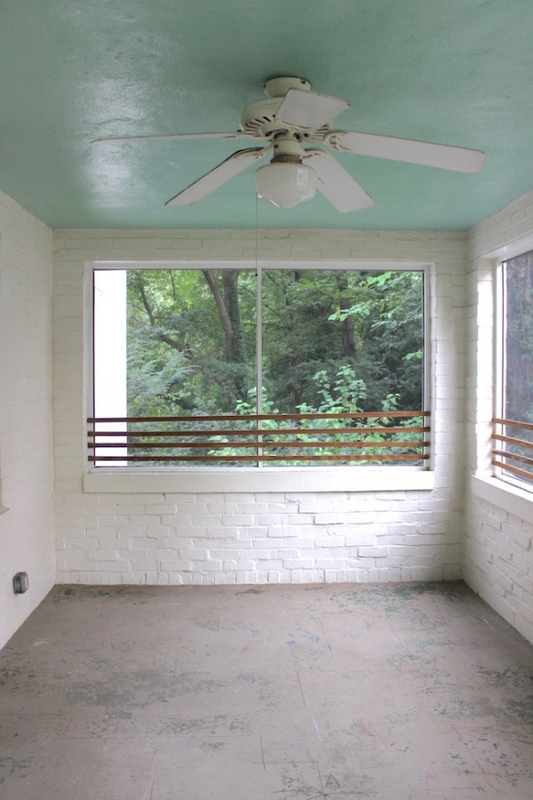 A few weeks ago I casually threw out the idea of a screened-in porch makeover to CT. When I mentioned tiling the floor, CT's ears perked up and he latched on. As the weekend rolled around, I was exhausted from the work-week and just needed one of those weekends with where Netflix is always on and you don't leave the couch. Friday night, CT comes home and he is ready for this porch project with all the supplies in tow. And with that, our weekend turned into another work weekend with a big task to accomplish...tile our nearly 200 sq ft. screened-in porch, although I can admit my weekend plans did not change. I just didn't have a forth work weekend in a row in me. Here is the before of our porch prior to the weekend. This is the 'true story' of the before. This porch was A MESS!! It had become a dumping pile for our previous work weekend supplies. Yuck. Like all things in our house, I still found the "before" (minus the mess) of our porch quite charming. The aqua ceiling, the concrete slab that had once been painted dark green giving it a distressed look and the white brick walls. The wood bars on the wall...not so much. I dreamed of making this a whitewashed, crisp and cool space but when I started looking for inspiration I loved this slate floor from this porch's floor. Most of our "dream" updates to the house, we have started to tackle ourselves choosing to try versus wait until we've saved up to have someone else do the project for us. One of the most surprising things to me so far in home ownership is how much we enjoy doing projects around the house, and how much we actually can do. CT and I have day jobs, so we have to find spare time to dedicate to the house projects like late nights after those day jobs and weekends. A lot of what you see here are our first attempts at home improvements projects like tiling, but there is a lot of satisfaction in building something. On Saturday, we got up early and headed to the tile store. 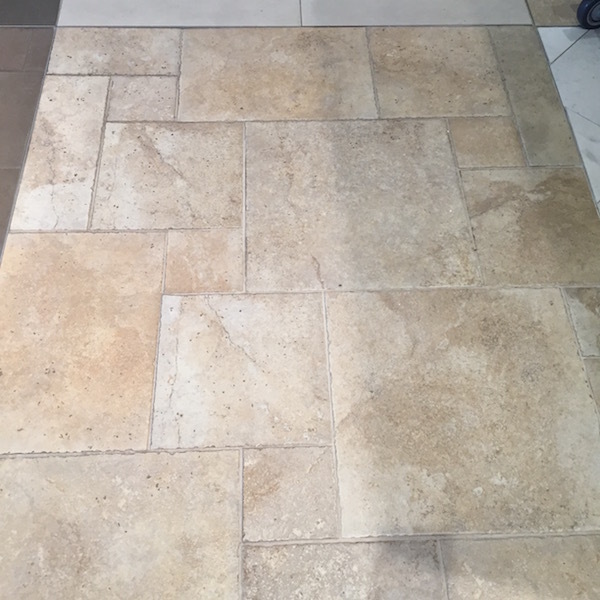 As tile newbies, we fully expected to hop into a store, grab the tile and go home to start laying it. A lot of places laughed at us for thinking we could tile our porch in a weekend (they were right) or let alone get our supplies in a weekend. The first place we tried was Specialty Tile in Miami Circle. 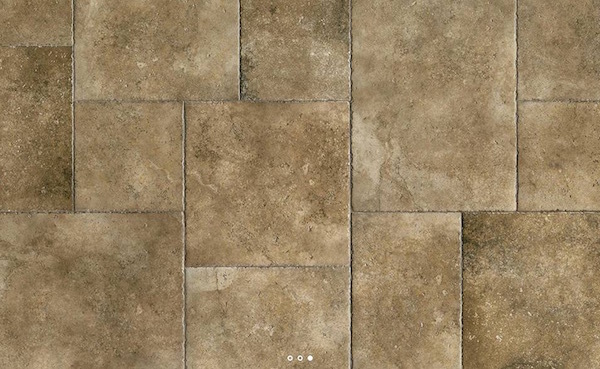 They had a really pretty stone that we loved in the lighter color, but unfortunately weren't able to get the tile to us that day unless we picked the darker version that we didn't like as much. Evidently the tile stores in Atlanta keep their tile outside the city and usually take at least a few days to deliver. 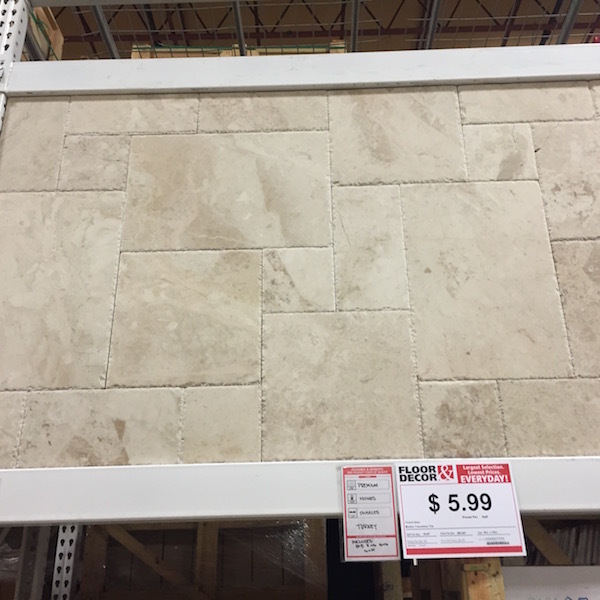 We went to Floor & Décor knowing that they have tile in stock that we could take home that day, and picked a lovely white/beige travertine tile. CT really owned this project (and he nailed it). He worked all day Saturday to the point that I had to make him stop tiling and go to bed at 1 AM on Sunday. 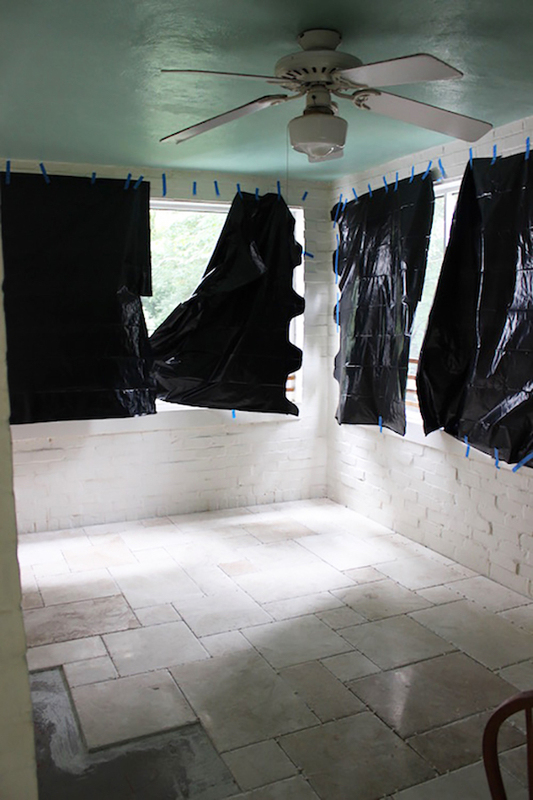 It even started raining and we had to put trash bags up over the screens to keep the rain out. Creepy, right? 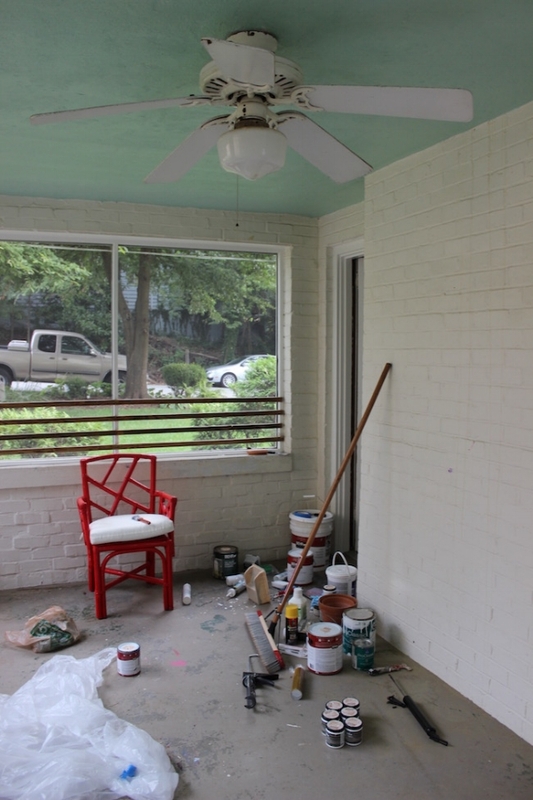 After a long weekend, CT completed the porch makeover and it looks amazing! Here is the after.